Submitted by HS on Wed, 2012-08-08 13:15. Submitted by HS on Wed, 2012-08-08 13:19. Similar to the PunchLight GPI and PunchLight MIDI, the PunchLight DLi automatically switches on an external light unit such as the RECORDING Display, RECORDING PlexSign, RECORDING Ring or Studio Warning Lamp. 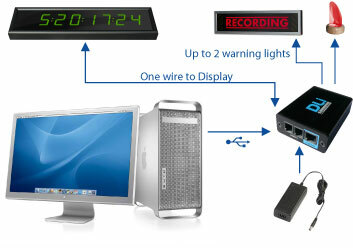 It has front panel LED status indication - recording or record ready. 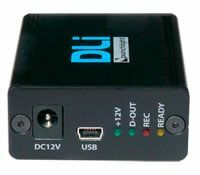 Two light units can be controlled simultaneously; the third output is a dedicated connection for the Studio Display XT2 or SD2 (second generation). The PunchLight DLi is connected via USB to a computer (PC or Mac) in your studio and the USB cable and 12V power supply is included. Submitted by HS on Mon, 2009-07-20 13:08.